HAVE YOU HEARD THE "FOR HER AGE" TAG? I was checking my new outfit in the mirror the other morning as I was getting ready for another day at the office, and I thought "I'm looking pretty good for someone my age". Bang! there is was.....the dreaded Midlife disclaimer "for my age". I think we're all guilty of applying it to ourselves. We're looking really good, but because we don't look like we did in our 20's, we think we're doing okay "for our age". Why do we judge ourselves so harshly? The judgements don't just stop with ourselves. We might start there, but it balloons out to include the women around us. We look at another Midlife woman and think "she's looking pretty good for someone her age" or "I think she could have chosen something different - she's not 20 anymore" or the all time great disclaimer "she looks like mutton dressed up as lamb". We're so quick to point the finger and we may not say it aloud, but we definitely think it inside our heads. I'm not sure when it starts that judgments are based on how old someone is. I do it all the time when I see someone looking good and I hear it from others regularly too. No-one says about a 20 year old "gee she's looking good for her age" or "she's in great shape for her age", but when it comes to life after a certain date you become either invisible or "good for your age". 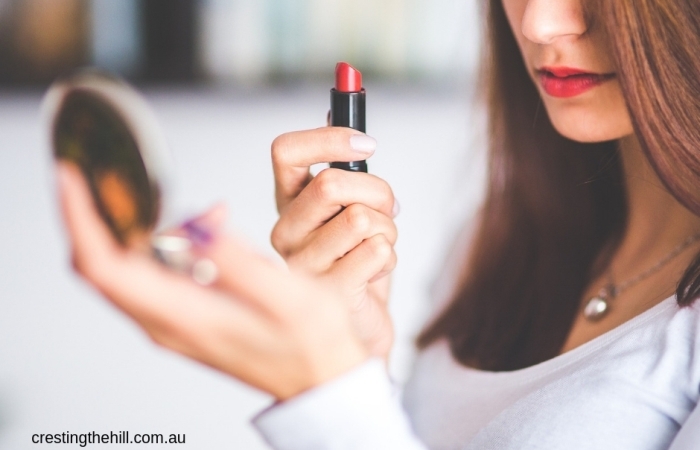 It also seems to be a "woman" thing - we're so quick to critique each other and especially to apply it to women who are trying to maintain their appearance into their Midlife years and beyond. Helen Mirren, the actress, has it attached to descriptions of her outfits all the time - particularly that shot of her taken in a red bikini. She was photographed emerging from the ocean looking slim, trim and pretty darn fabulous (mind you she never had children so her tummy didn't suffer the indignities of being stretched to the size of a small town and deflated again numerous times - so that helps a bikini photo no end). I noticed another pic of her in a purple swimsuit and she looks much more like a woman in her second half of life - still pretty "good for her age" though! The photos were prime examples of newspapers wanting to show a woman who looked remarkably "good for her age" - and women everywhere compared themselves and wondered how they could look like that when they were in their 60's. I bet the 20 somethings weren't comparing or judging - but a lot of Midlifers would have been. I've also noticed people apply it in the negative too - "really, you wouldn't think she'd be wearing those earrings at her age" or "you'd think she'd be a little more settled at her age" or "that skirt's a bit short for someone her age". There seems to be a magic age where this disclaimer becomes normal and I'm yet to figure out when that actually is......maybe it's about 42 (the answer to the universe's question). At some stage I'll have to start surveying a spectrum of friends and see whether they hear it or not to determine an approximate start date. I can't imagine it applying to the 30 something young mum down the street so it must be a later stage and I'm thinking somewhere between forty and fifty? 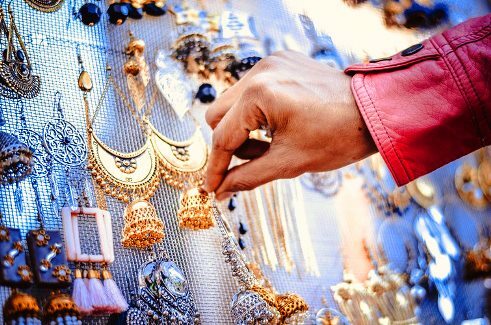 I don't know about you, but if I think something's pretty and it makes me feel pretty, then why shouldn't I buy it or wear it? If I like to colour my hair and not embrace the grey, or if I want to wear bold jewelry, or if my legs look good in shorts, why not just go with it? It's time to stop criticizing ourselves and other women - we're not the judge and jury of how others choose to dress. 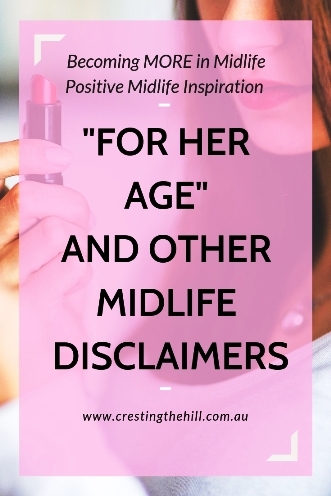 WHAT DO WE DO ABOUT THE MIDLIFE DISCLAIMER? So, do we fight the disclaimer or take it on board as a compliment or a gentle reminder (if we've had the audacity to forget how we should be behaving at that 'certain age')? It has to be better than being invisible (the other curse of the Midlife woman) because at least people have seen you to be able to pass comment on your appearance or behaviour, but it is still another nail in the coffin of middle age when your outfit choice is subject to a disclaimer even when you know you're looking pretty darn fantastic "for your age"? I think the first step is to stop applying it to ourselves - why not just admit we're looking good and drop the disclaimer? Then we can progress to extending the same graciousness to our fellow Midlife women - pass a compliment and share a smile - and don't let age even come into the equation. Let's be each other's cheer squad and encourage each other to shine our lights in this hyper-critical world. hm. I never think that, or say it. It's usually, look at Jane Fonda, she looks AWESOME. For anyone, any age.